Dmitri Mendeleev was the first person to organize the elements in a meaningful way. 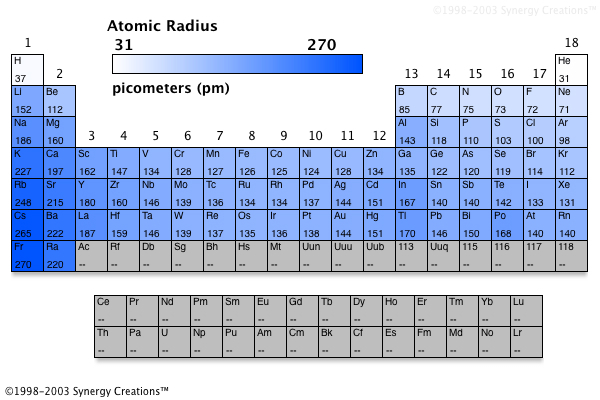 Although organized by atomic weight rather than atomic number (a quantity unknown in Mendeleev's time), his periodic table showed that elements in the same group (vertical columns) possessed similar chemical and physical properties. Interestingly, he left blank spaces in his table where he felt undiscovered elements may be found. Mendeleev made predictions about the properties of some of these potentially undiscovered elements, and when discovered later - and with properties similar to those predicted by Mendeleev - the periodic table earned credibility. The Periodic Table - Physical and chemical properties as well as background information on all the elements. Each element includes links to other sites that feature that element. Within a group, atomic radius increases from top to bottom. This is a consequence of increased energy levels as one moves down a group. Increased energy levels equates to larger orbitals and therefore more room for electrons to travel. Across a period, atomic radius decreases from left to right. While it is true that the number of electrons increases from left to right, so does the number of protons. Since there is no increase in energy level, orbital sizes should be expected to remain constant. However, the attraction of the protons (and recall they are about 1820 times more massive than electrons) for the electrons shrinks the orbitals and makes the atom smaller. Electronegativity measures how strongly an atom will attract electrons to itself when bonded to another element. The opposite of this is electropositivity. There are some generalizations that can be made that predict whether an element will be electronegative or electropositive and how strong it will be in that regard. The table given below covers these points. Consider the two periodic tables below. Note the strong correlation between atomic radius and electronegativity. 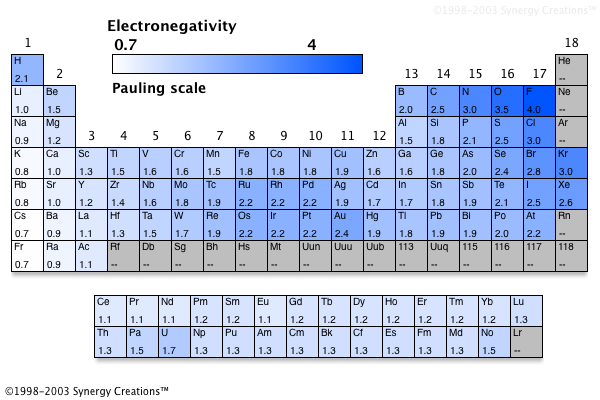 Can you see that the elements with the smallest radii have the highest electronegativity values? This is due to the absence, or at least weak, shielding effect shown by smaller elements. • successive electrons are removed. This is because the remaining electrons can be more strongly attracted the protons in the nucleus. • atomic radius decreases. Thus, removing an electron from an atom becomes more difficult (requires more energy) from left to right across a period and from top to bottom in a group. In other words, the smaller an atom is, the more the electrons can be equally attracted to the nucleus. This makes ionization energy increase. • energy levels are removed. For example, the first ionization energy for sodium is relatively small, since it is a lone electron in the 3s sublevel. Furthermore, removing that electron makes the highest energy level for sodium its second, which has a full 2s and 2p sublevels. Removing a second electron from sodium is significantly more difficult, as the remaining electrons are part of a noble gas configuration (octet). Within a group, density increases from top to bottom in a group. While both mass and volume (due to an increase in atomic radius) are increasing as one moves down a group, the rate of increase for mass outpaces the increase in volume. As a result, density is largest for the elements at the bottom of the group. The intriguing trend occurs within a period. In this instance, density peaks in the middle of the period. With regards to the 4th through 7th periods, it increases from left to the middle, and then decreases (more rapidly) from the middle to the right. Moving left to right, the d-block and f-block elements add electrons to orbitals that are not on the highest energy level. This means that they are not the farthest from the nucleus (the two electrons in the s sublevel are). At the same time, protons and neutrons are being added to the nucleus, which adds mass. Since the mass increases, while radius declines, density increases. Additionally, the overlapping orbitals of neighboring metallic atoms allows for greater malleability, and atoms can be pushed close to each other. Upon emerging from the d-block and entering the p-block, two things happen. Firstly, electrons are being added once again to the outermost energy level which creates a spike in atomic radius at the beginning of the p-block. Consequently, volume increases and density drops. Furthermore, the lack of overlapping d-orbitals means that individual atoms are not as close together anymore. In fact, once the far right has been reached, the elements are no longer metals at all. This lack of tightly packed atoms causes a change from solid to gaseous elements as one moves to the right of a period. Despite mass still increasing from the additional protons and neutrons, the significant space that exists between atoms dramatically increases volume and causes density to drop significantly in the latter half of the p-block. Recall that specific heat is a constant that describes how much energy is needed to change the temperature of one gram of a substance by one degree Celsius. A substance with a small specific heat value is easy to alter its temperature. Substances that have particles in close proximity can transfer energy quickly because their increased vibration will immediately affect the particles with which it is indirect contact. Substances that have greater particle separation require more energy to change their temperature and therefore have a larger specific heat value. Essentially the specific heat trend is the inverse of the density trend. That is, elements with a large density have a low specific heat value. This means that the elements with the lowest specific heat value are located in the middle of the bottom rows of the periodic table, exactly where the densest elements are located.